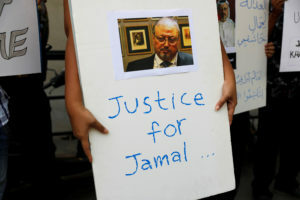 WASHINGTON — President Donald Trump said there is no reason for him to listen to a recording of the “very violent, very vicious” killing of Saudi journalist Jamal Khashoggi, which has put him in a diplomatic bind: how to admonish Riyadh for the slaying yet maintain strong ties with a close ally. Trump, in an interview that aired Sunday, made clear that the audio recording, supplied by the Turkish government, would not affect his response to the Oct. 2 killing of Khashoggi, a columnist for The Washington Post who had been critical of the Saudi royal family. On Saturday, Trump said his administration will “be having a very full report over the next two days, probably Monday or Tuesday.” He said the report will include “who did it.” It was unclear if the report would be made public. American intelligence agencies have concluded that the crown prince ordered the killing in the Saudi Consulate in Turkey, according to a U.S. official familiar with the assessment. The official was not authorized to discuss the matter publicly and spoke on condition of anonymity. Others familiar with the case caution that while it’s likely the crown prince was involved in the death, there continue to be questions about what role he played. Trump noted to “Fox News Sunday” that the crown prince has repeatedly denied being involved in the killing inside the Saudi Consulate in Istanbul. He said that Congress will await the Trump administration’s report in the next two days and that the U.S. will need to be clear about the ramifications of sanctions, given Saudi Arabia’s strategic role in the Middle East. For his part, Sen. Lindsey Graham, a Trump ally, said the crown prince has been a “wrecking ball” in the relationship between the U.S. and Saudi Arabia. “I have no intention of working with him ever again,” said Graham, who is in line to be the next chairman of the Senate Judiciary Committee. Intelligence officials have been providing information to Trump for weeks about the death, and he was briefed again by phone Saturday by CIA Director Gina Haspel and Secretary of State Mike Pompeo as he flew to California. White House press secretary Sarah Huckabee Sanders provided no details of his call but said the president has confidence in the CIA. Before his call on Air Force One, Trump told reporters that when it came to the crown prince, “as of this moment we were told that he did not play a role. We’re going to have to find out what they have to say.” That echoed remarks by national security adviser John Bolton, who said earlier this week that people who have listened to an audio recording of the killing do not think it implicates the crown prince. But he has resisted calls to cut off arms sales to the kingdom and has been reluctant to antagonize the Saudi rulers. Trump considers the Saudis vital allies in his Mideast agenda. But members of Congress are pushing Trump for a tougher response to the killing. The administration this past week penalized 17 Saudi officials for their alleged role in the killing, but American lawmakers have called on the administration to curtail arms sales to Saudi Arabia or take other harsher punitive measures.